Soooo, I found this book at my local thrift store, that I tend to frequent and buy from often. So while browsing through their large selection of second hand books, I came across this catchy title. When I pulled it down from the shelf I was stunned to see such a beautiful cover. Now, let me first say that I am largely attracted to beautiful covers. I find that the more beautiful the cover, the more I enjoy the book. I know, weird right?! Anyway, I bought this book solely on the fact that had a beautifully vintage cover, and I could not walk away without having this book in my possession. 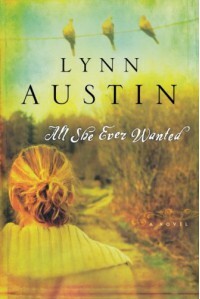 When I got home, and searched it on Goodreads, I was happy to find that not only does it have a gorgeous cover but that it is historical Christian fiction novel centered around a 4 generation family with secrets. Wow, I feel like I just hit the jackpot of a book. I cannot wait to dive into this book. It seems like the perfect book to read on a summer day while laying on the sundeck of boat drinking and iced tea. Full review to come upon completing.